The phrase "Frito pie" conjures up some pretty awesome images already (provided you're in an area of the country that this delicacy has already found its way to), but Papa John's is about to put a whole new spin on the concept. 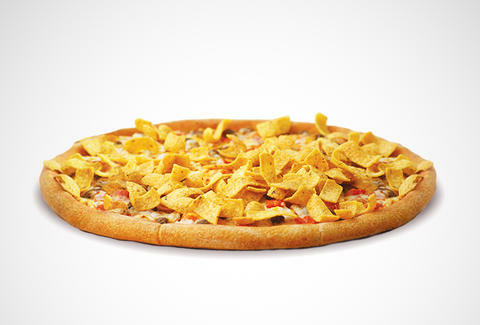 Now through November 23rd, the chain is cranking out Fritos Chili Pizzas for the hungry masses nationwide. And they certainly walk the (taco) walk. The ($12 for a large) Fritos Chili Pizza features a base of chili sauce, along with ground beef, Roma tomatoes, cheddar, mozzarella, onions, and a generous helping of Fritos on top. For those concerned about the, er, structural integrity of the Fritos placed on top of a hot pizza, look no further than this video, which clearly shows that they retain their crunch well into the tasting experience. Say hello to the Frito pie pie. Adam Lapetina is a Food/Drink staff writer for Thrillist, and can't believe he didn't think to put chips on top of pizza before. Read his musings at @adamlapetina.